Yet, there have been many questions concerning alcohol being used as a wound antiseptic. So, I thought this might be a good subject to post on. (To all my American Preppers followers, I have already posted the majority of this under the Little Doc section). There are better forms of disinfection than cracking out a cocktail, but to some extent, it is true that certain liquors do in fact treat wound infections. They burn like a monkey beating, but they do work. (Image taken from: Closebutsofar.com). It is true, there have been actual cases where men have been mauled and bitten by wild animals, such as bears, and icing them with Toddy saved their lives. So it is definitely not a myth that spirits saves lives. 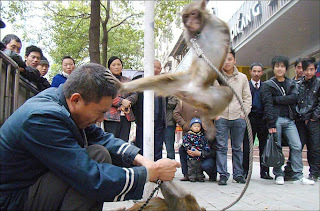 [Man, can you believe this kung-fu-monkey kicking the crap out of that guy? It's seriously giving him a Jackie Chan smackdown. Like a Chuck Norris chimp kind of thing. Anyway, while in the field and there is no other source of disinfectant available, liquor is a great alternative to field water. Granted, your buddy will want to kill you as you pour that firewater on his open wound, but think on the bright side... he's injured and you can run faster. There is one problem though. Alcohol can, unfortunately, work too well and cause tissue damage due to its ability to penetrate and lyse cells. Hence, the reason for its effectiveness against bacteria. You pour moonshine on an open wound... bye bye bacteria, but also many good cells go down with it. It's like Rambo saying, "I'm taking you all down! And your little dog too!" The 'Proof' is in the Pudding. Anyway, on a more scientific note, it is the alcohol content that determines the hooch's antiseptic abilities. 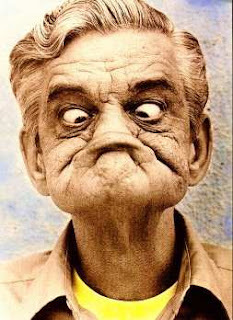 When you see an old drunk in a western movie down some diesel fuel and make a face like he's dying. Then he chokes out a barely audible gasp with satisfied smile, "Now, that's the good stuff." You know he's talking about at least 35% alcohol by volume (ABV) or 70% proof. See and you thought old westerns weren't scientific. And that type of liquor is the "good stuff"
In order to cleanse a wound, the drink must be at least 35% alcohol (ETOH) or it's disinfecting capabilities are practically nil. Not at least 35% ABV then you might as well pour apple juice on the wound. Beer 3-12% ABV. Sorry guys, your beer isn't worth Jack. Wine 9-16% ABV. Ladies, the romantic films where the woman pours a bottle of wine on her dying hero's wound to save his life, are liars! Woman pours wine. The bacteria remain and cause sepsis. Hero dies, end of story. Fortified wines. (aka port, madeira, sherry, etc.) 15.5-20% ABV. Only good for cooking. Brandy 36-60% ABV. Brandy does well against infections. Pure vanilla extract. The poor man's ponto. >35% ABV. What do you know! You can totally sterilize a wound and smell like vanilla at the same time. Vodka. I understand the Nazi German's used this substance to turn Russian prisoners into human flame throwers. Yikes. Is it potent crap? Rating in at 32-80% ABV, yes it is! (Pure Russian brands coming in at closer to 80%... Go Russians, they can sterilize wounds and kill livers at the same time. Rum and Gin 40-80% ABV. Whisky. 40-55% ABV. Like you were expecting Whisky to score lower. Raki. 42-86% ABV. I have never heard of this paint before. I wonder if it is related to Saki, on it's mother's side? Poten. 60-95% ABV. I love this one's name, especially because it is one of the most potent. Neutral grain spirit or moonshine 95% ABV. We have a winner. That's practically ethyl alcohol! It might as well be sold in the pharmacy section of Walmart with a sign on it saying, "Moonshine, it's medical grade." So now all you have to do is open up moonshine businesses in your back yards and when the cops come to bust you, you can tell them that you're running a medical supplies company specializing in antiseptics. 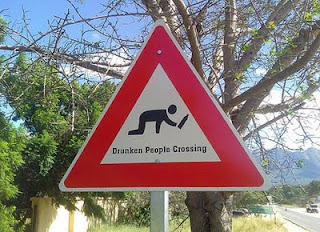 One more word of warning: Do NOT drink and clean wounds at the same time. None of that: "One for the wound, one drink for me. One shot for the wound, two shots for me." Not good. Bad idea. And remember, "Friends don't let friends drink and do wound care." Just for he heck of it, here are a few more monkey pictures, from zomporo.com and everydaynodayoff.com. This one is just too funny. Scary, but funny. 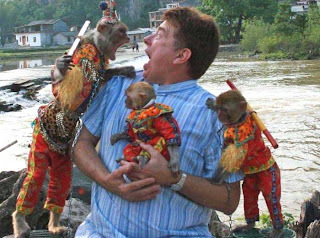 I think this monkey was ripping the guy a new one one about wound care and booze. And I couldn't help, but go "awww how cute!" when seeing this picture from EverydayNoDayOff.com. Those clown(?) monkeys. 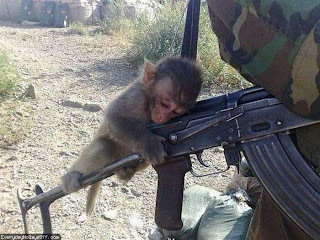 Greatest monkey pic ever. And awesome. Thank you for this wonderful post. Forwarding to friends...now.